Carol’s first grade teacher, Miss Kroll, wrote this on her report card from Bridgeboro School, New Jersey in 1948. How right her teacher was! 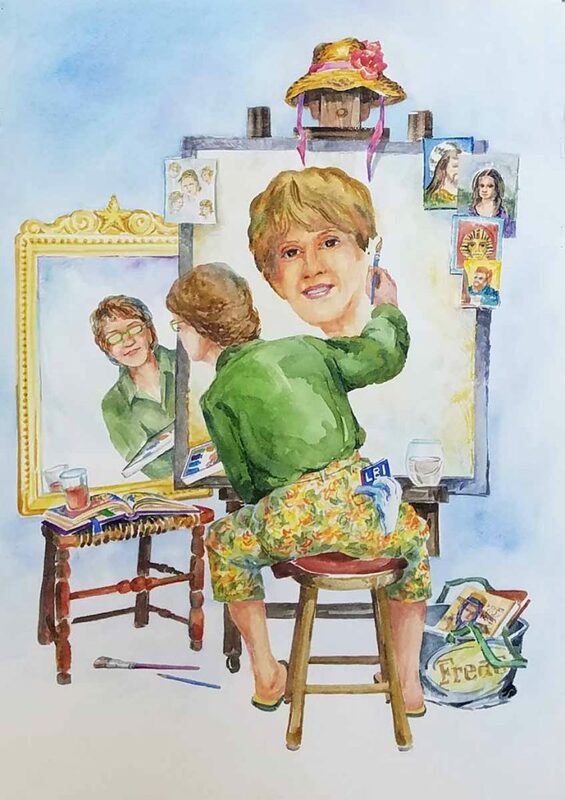 Carol Freas is an accomplished artist and teacher as well as a gardener, devoted mother, caring wife, dedicated daughter and sister, and a true friend to many. I’ve had the pleasure of knowing Carol for several years and the longer I know her, the more fascinated I become with her many talents. We met several years ago at the summer concerts in Ship Bottom while discovering common interests in music, singing and dancing. Carol and her four brothers moved to Surf City with her father after her parents divorced in 1951. When Carol was twelve, her mother died of cancer so she used her creative imagination to escape the void. Carol attended Southern Regional High School where she met her husband Ray. After high school, she studied at Kutztown College in Pennsylvania graduating in 1965 with a BA in Art Education. While there, her father remarried Jane Lathbury, and sister Shelley soon arrived. After marrying in 1966 and having two children, Tara and Travis, Carol combined her interests in art and gardening by creating gardens on paper in watercolor. Using the brilliant colors of flowers and vegetables in landscapes and still life, work eventually led to participating in her first outdoor show in 1976 in Virginia. Like many moms, her studio was part of the basement playroom where sewing drapes, bedspreads, tailoring Ray’s suits and even canning pickles and tomatoes with unique labels also took place. Carol and her family returned to our area in 1986 adding local historic interests to her colorful collections. Her paintings make me smile because they are happy, familiar scenes that capture the lure of LBI: children playing in the water, grownups relaxing in beach chairs, seashore gardens and notable buildings. Beyond all else, she is a dear friend to many. Shortly after Superstorm Sandy, even though Carol was helping her 90-year-old mother restore her home, she took time to bring me food while I was cleaning my own damaged home. Her kindness and spirituality see goodness in all of God’s creations and her work captures her upbeat spirit and personality. See for yourself and check out Carol’s happy scenery and brilliant colors at Things A Drift at 405 Long Beach Boulevard, Ship Bottom. Or take a watercolor class with her at the LBI Foundations of Arts or Pine Shores Art Association.